This South African safari combines the most popular wildlife reserve, the Sabi Sand, with the largest one in South Africa, Tswalu in the Southern Kalahari. Cape Town adds a marine wildlife element to the adventure with seasonal whales and great white sharks. The diversity of wildlife one observes between these three distinct ecosystems is astonishing. Tick off the "Big Five" while also tracking unique nocturnal animals like aardvark, unique antelope like the sable and the impressive Kalahari lion. This itinerary combines the "Big Five" wildlife of the Sabi Sand with the unique black rhino, Kalahari lion, aardvark, aardwolf, sable antelope and other rare species of the Southern Kalahari desert. You're in private wildlife reserves throughout the safari, and then Cape Town is a nice transition back to civilization at the end, with the added bonus of marine wildlife and beautiful scenery. 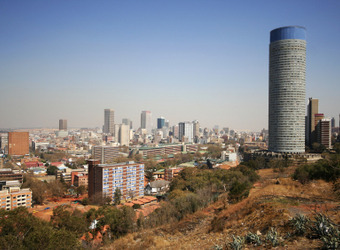 Cosmopolitan Johannesburg is the jumping-off point for most South African safaris. The city of 3.6 million is a vibrant mélange of colors and cultures. Food and music are central to life in ‘Joburg,’ and its clubs and pubs are an integral part of the social fabric. Tour Soweto or visit the Apartheid Museum to gain a deeper understanding of Johannesburg’s history, travails and rich multicultural heritage. 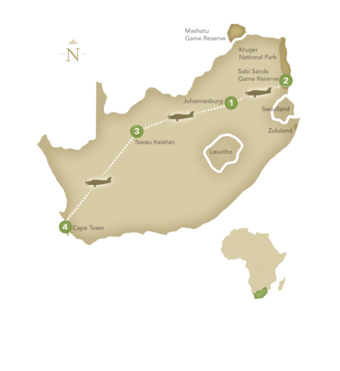 Fly to the famed Sabi Sand today. 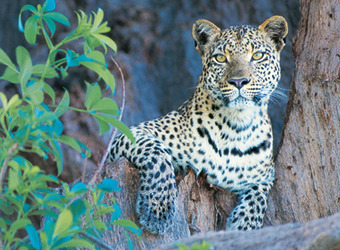 Sabi Sand is one of the world’s most extraordinary wildlife locales. This private 150,000-acre reserve shares a border with Kruger National Park and is named for the two rivers that flow through it. Renowned for its excellent “Big Five” viewing—the elephant, rhino, Cape buffalo, lion and abundant leopard, which were once favorite hunting targets—Sabi Sand has led the way in bringing them back. 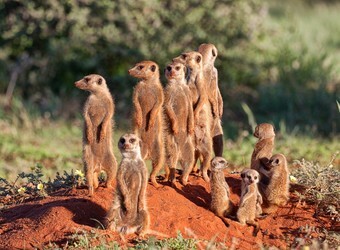 Fly via Johannesburg today to Tswalu Kalahari Private Reserve. Situated in South Africa’s Northern Cape province, this area is often known as the “green Kalahari” for its ability to support a broad diversity of plants and wildlife. This semi-arid grassland hosts rare species, such as Kalahari black-maned lions, roan and sable antelope, Hartmann’s mountain zebra, a good population of desert black rhino, cheetah, gemsbok and many more. Friendly meerkats are a highlight! Fly directly to Cape Town today. Located at the Southern tip of the African continent where the Atlantic and Indian oceans meet, Cape Town and the Western Cape are strikingly beautiful. 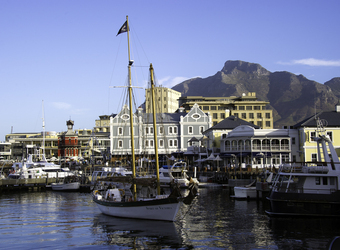 At the foot of Table Mountain, the city of 3 million is a charismatic blend of cultures, renowned for its scenic setting, creative cuisine and world-class local wines. 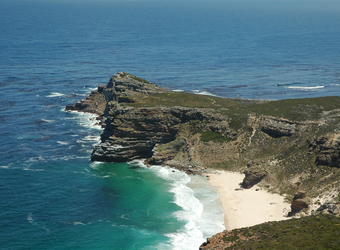 Outside the city, enjoy spectacular beaches, sheer sea cliffs along the Cape of Good Hope, and wildlife encounters from penguins to sharks, including a private, full-day Cape Peninsula excursion. Bid farewell to South Africa today as you depart for home.